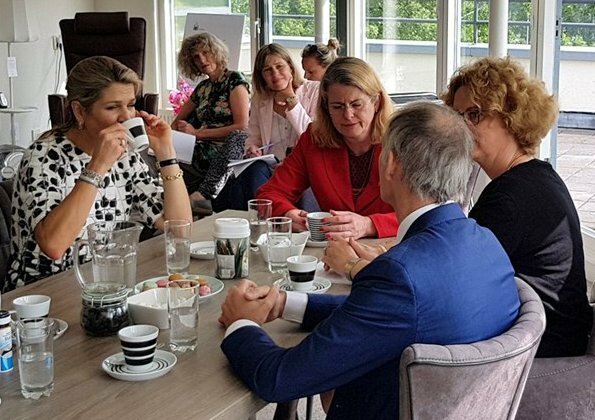 On June 1, 2018, Dutch Queen Máxima visited iZi-Experience home (iZi- ervaarwoning) in The Hague in order to receive detailed information about "Haags Ontmoeten" project. 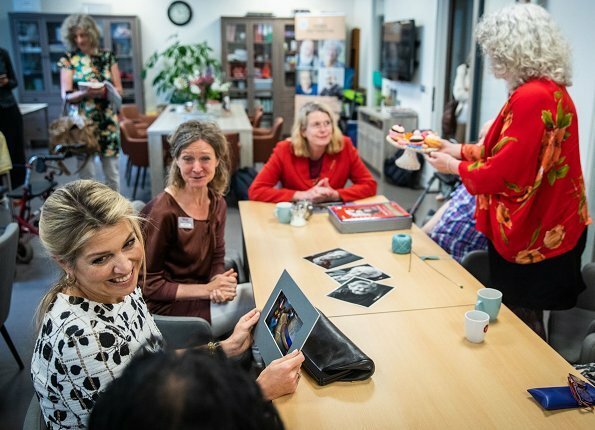 The IZI project aims to enable residents of The Hague to live pleasant, safe, healthy and independent lives in their own homes. 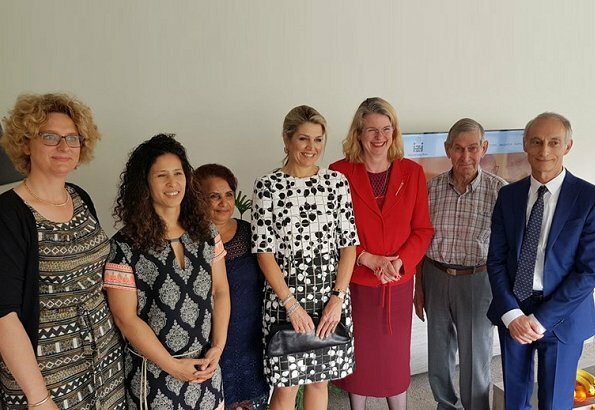 The project has three aims: to improve care and well-being, provide support to enable residents to take full part in society and improve homes and living environments. 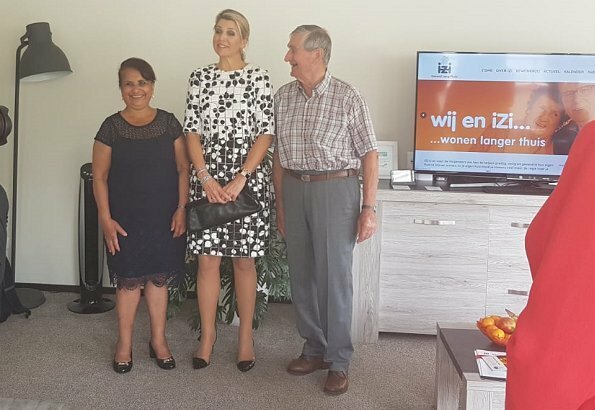 Currently, a show home in an apartment block for the elderly run by HaagWonen in the district of Escamp is being equipped with the latest technical gadgets. It gives residents an opportunity to experience how technology can help them. Nice work day dress, that would have looked better two inches longer in my eyes. Accessoires are better than the last time. But... Plastic clip alarm 😯!! She is one busy queen who dererves any respect, but there are better ways to hold a ponytail together. After all the remarks about how awfull her hair looks, she's finally 'experimenting' with the ponytails. Give her a break and stop complaining! lol. However you must admit Beth, that plastic comb grip fits in perfectly with the general ambience of that last photo, drinking coffee or tea. :) And I'm being sincere. 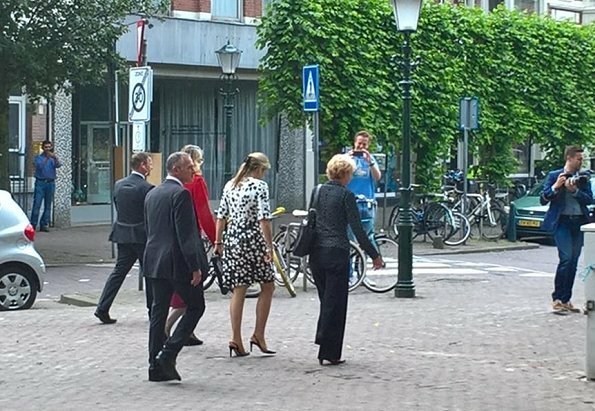 I think that just once in a while.. after seeing all the hard working, high profile stuff that she does, sometimes of her own choice and other times not, scenes like these.. and clip hair grips like these just attest to the very normal and human person Maxima is, that we respect and admire. I actually think, the ponytail suit her and her hair looks good today from the front. But a plastic clip is not a good choice, that's all. Pretty dress, but it would look much better if her knees were covered. I agree about the knees. Why do designers make such short dresses when the knees are not particularly beautiful on almost everybody? This is a lovely dress, just too short. Queens are always on display so they should be modest and comfortable - as well as beautiful. Agree that plastic clip is not appropriate or classy. Do not think hair is much better today with strands coming down by her face. The last picture of a previous engagement with the small black hat is so much better regarding her hair. Wish the dress were a bit longer, but it is a pretty dress that overall fits her nicely. I like this dress the combination of light on top and darker on the bottom,the hair is out of her face, she looks good. Love the dress, both style and pattern. Clutch and jewellery great, plastic clips don't bother me. Her hair is... her hair but it's away from her face. Her best accessory is her smile - she always comes across as very warm and engaging. It is a nice dress, but I agree with Beth, it is too short to be elegant. Maxima is smiling and beautiful though.